The Madrid region is one of the 17 autonomous regions in Spain situated in the geographical centre of the country. The region’s current population is over 6 million inhabitants, the great majority of whom live in the metropolitan area. As the capital of Spain since 1561, Madrid is home to the country’s principal institutions: it is the seat of the central government and the official place residence of the Spanish king and queen, and it boasts major international bodies such as the World Tourism Organisation (UNWTO). 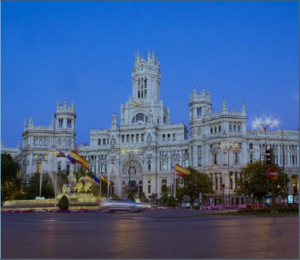 Madrid is one of the principal destinations for major multinational companies’ headquarters and an important business centre. Madrid has witnessed the birth of celebrated universal figures such as Miguel de Cervantes, Lope de Vega, Calderón de la Barca, Francisco de Quevedo, José Ortega y Gasset, Gregorio Marañón, Juan Gris, Juan de Villanueva or Joaquín Rodrigo. Madrid is famous in the world for its network of cultural life, over 100 museums, 200 theatres, countless galleries, exhibition spaces and art centres, plus a wide variety of world class events, such as the Spring Festival for Performing Arts, PhotoEspaña, ARCO, the Madrid en Danza International Festival or Suma Flamenca, which turns the region into the last word in flamenco, to name a few. The Art Walk reunites the Prado Museum, the Thyssen-Bornemisza and the Reina Sofía Museum in a unique district where visitors can steep themselves in art, from the great masterpieces in the universal history to the latest trends at the vanguard of art today. Emblematic spaces such as the Plaza Mayor and Plaza de Oriente squares, the National Library, the Royal Palace and the Church of Los Jerónimos present Madrid at its most monumental, not forgetting the historic towns and various sites around the region such as El Escorial, Toledo, Segovia or Aranjuez.